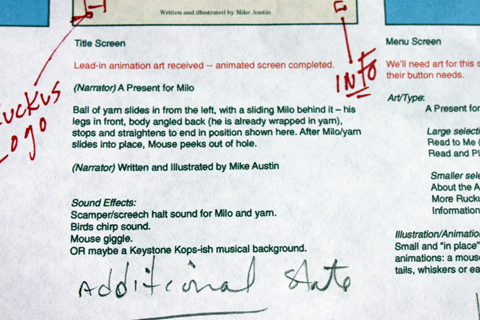 Our discussion about the making of the iPad story app “A Present for Milo” continues. . . .
7. What art media did you use? And what computer apps did you use yourself? Mike Austin: I use a lot of scanned textures in my illustration, so before I began I gathered up a folder of all the things I wanted to use (different kinds of paper, cloth, banana leaves, etc. 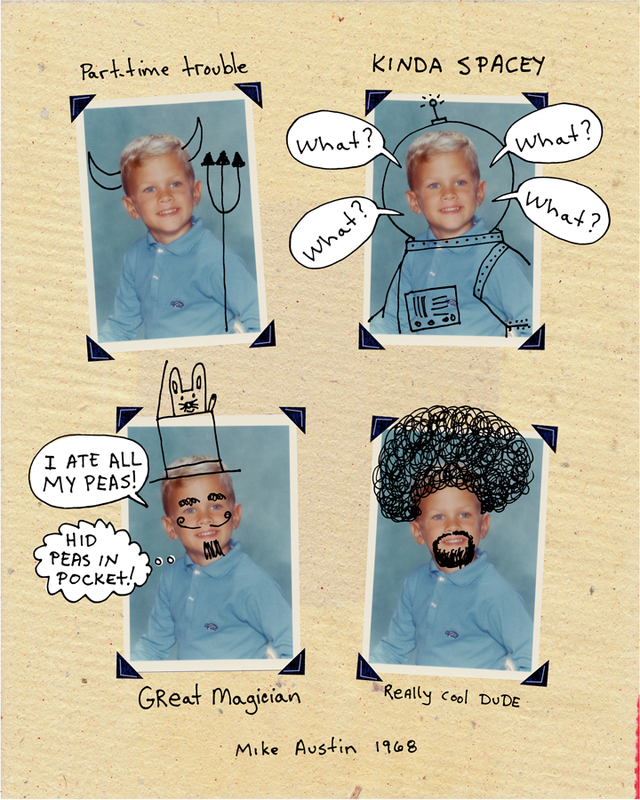 ), I worked in Illustrator and Photoshop on the Mac. 8. What was the approval process or protocol between you, Rubin, Sequel Digital, and The Ruckus Media Group? Time frame? Rubin Pfeffer: It was an iterative process — we approved it as we went along. I touched base with Ruckus at key points along the way. Ruckus had the same objective: Great storytelling. They were actually more resolved to avoid gratuitous clickables that might suggest anything gimmicky. 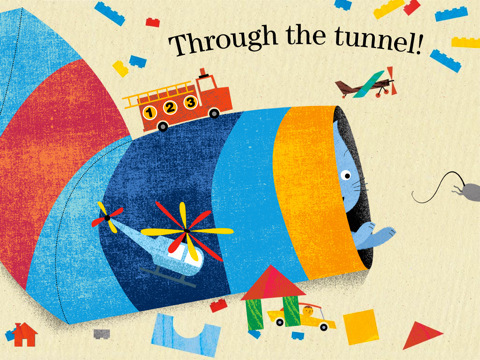 The intent all along was to deliver a delightful reading experience that very young children would enjoy, and in turn, would be endorsed by parents and educators. Mike Austin: It was a great collaboration between everyone. It went very smoothly. Sharon, Ken and I would communicate just about every day, with cc to Rubin. We focused on one screen at a time. I would send the layered Photoshop files of the finished screens to Sharon for review. 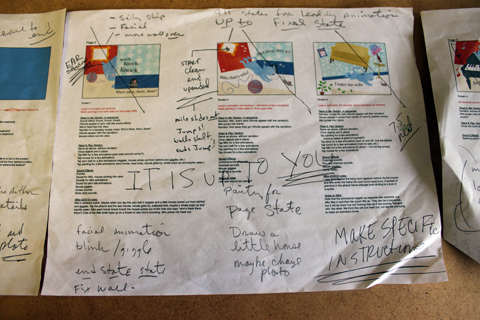 Ken would program the screen, and then send a prototype app that Rubin and I could upload to the iPad for proofing. It was so funny, because I would get the app loaded, and then start jumping up and down, screaming “THIS IS SO COOL!!! !” The farther along we got the funnier our video Skypes became. Joy Chu: Could you address the topic of voice-over? That is, did reading the text aloud have an effect upon who was selected to do the vocals? Who was responsible for that end of it? Rubin Pfeffer: Mike’s reading was the most natural. He recorded a preliminary track that we planned to use only for visual pacing. 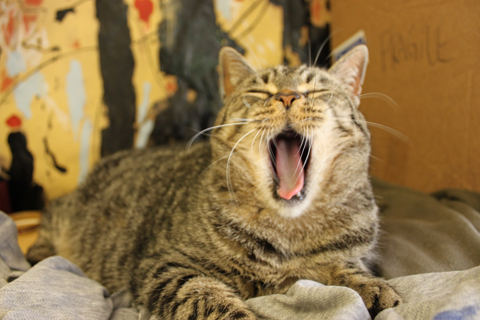 We’d always intended to bring in a professional reader. When it was time to do the actual voice-over, we did a test with a professional. It was very good, but it lacked the authenticity that we’d come to enjoy from Mike’s voice. So we sent Mike back to the studio to re-read the manuscript. This time he was the voice celebrity. It just wouldn’t have been the same with someone else. Most of the sound decisions were invented and decided between Mike and the Sequel Creative team, Sharon and Ken Streger. They had great fun “illustrating” with sound! I got to see what a silly kid-at-heart Mike is, by listening to the many sounds that he himself is able to make up, right there on the phone. 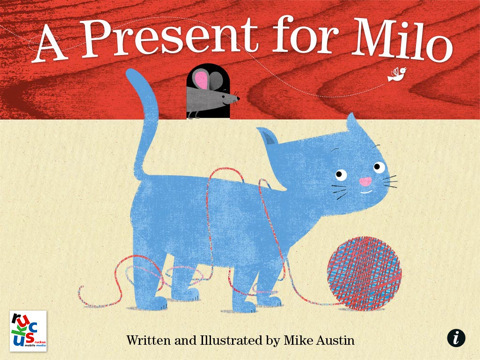 Mike Austin is both author and illustrator of “A Present for Milo,” the first iPad app by the Ruckus Media Group created from an original story. Mike was a full time illustrator/graphic designer for many years. We’ll look at how the seed for “Milo” was planted and grew, from its beginnings as a traditional book dummy, to interactive iPad app. We will also meet his agent, Rubin Pfeffer of East/West Literary Agency, who subsequently sold a 3-book deal for “Milo” and Mike Austin to Blue Apple books. 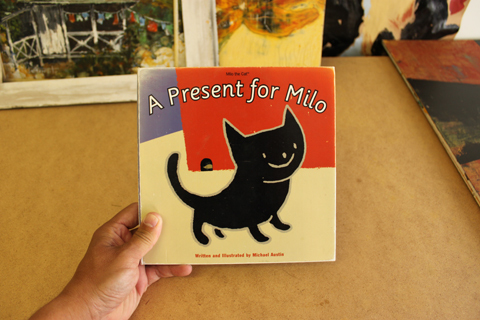 Milo, the original inspiration of "A Present for Milo"
1. According to the Ruckus Media Group blog, the idea for Milo actually began 15 years ago, when your daughter was two. Has the story changed very much over that time? 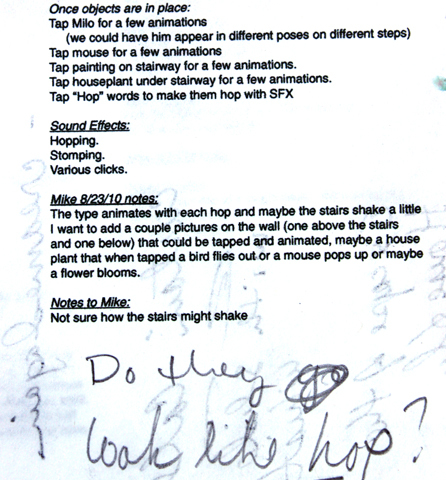 Mike Austin: The concept behind the story really didn’t change all that much from the original idea of a cat/mouse chase around the house. We (my daughter and I) were wondering what the heck Milo did all day besides eat and sleep! 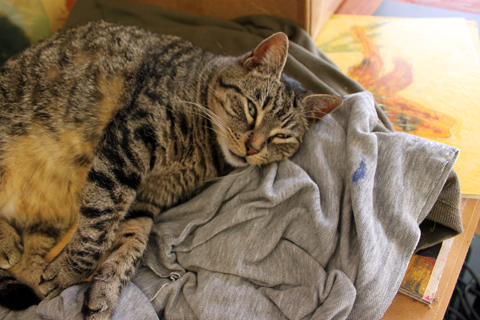 We thought maybe he’s actually running around all day, and that’s why he’s so tired all the time. Milo the muse. . . .
It’s funny because it wasn’t really thought out very much. I just sat down and started doodling and writing a very simple story, with the only intention being to draw funny pictures with my daughter before bed. Rubin Pfeffer: It’s the simplicity of the story that yields all the charm! 2. How did you meet your agent, Rubin Pfeffer? Did he help you realize your vision for Milo? Mike Austin: I hadn’t been actively seeking an agent, so when I received an email from Rubin (last March or April), I was thrilled! Rubin had seen portfolio samples of my work on one of the illustration portfolio sites. He was interested in seeing more, and possibly collaborating on some projects. The feedback and insight I got from Rubin was invaluable. I think he’s a Jedi. Rubin Pfeffer: Truth be told, his wife Jing Jing Tsong‘s work first struck me and going through her portfolio, I came upon Mike. They are both marvelous talents and I am eager to shepherd Jing into the world of children’s content. 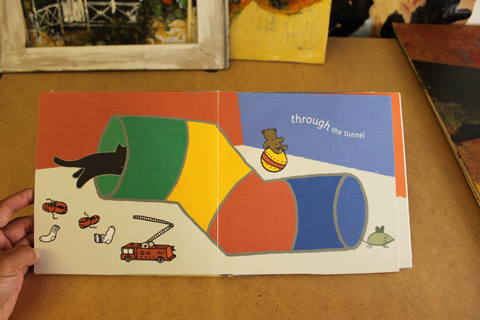 Both Mike and Jing are developing very young, playful stories. 3. 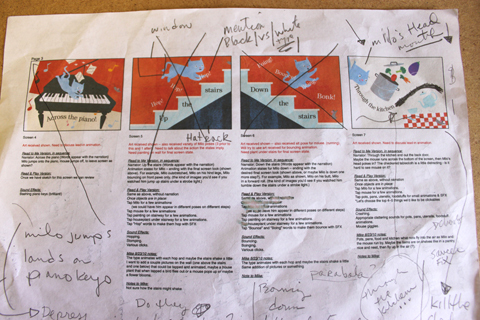 You fleshed out Milo using traditional bookmaking methods: Storyboard; character studies of Milo; a schematic of his domain etc. before moving on to the book dummy, yes? Mike Austin: Well… for the most part, although I didn’t really know the right way to go about it at the time. My illustration style and approach to design is completely different from what it was 15 years ago. After digging around some boxes on a shelf under the house, I found my original dummy. It was cringe-worthy. 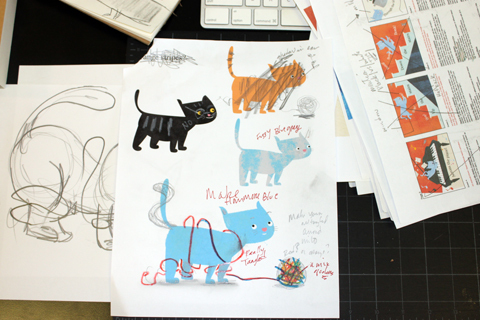 I spent about a month redrawing everything in my current style, and laid out the book the right way, with a lot of helpful feedback from my wife, illustrator Jing Jing Tsong . Cover from a 1995 book dummy for "Milo"
I sent a pdf to Rubin. 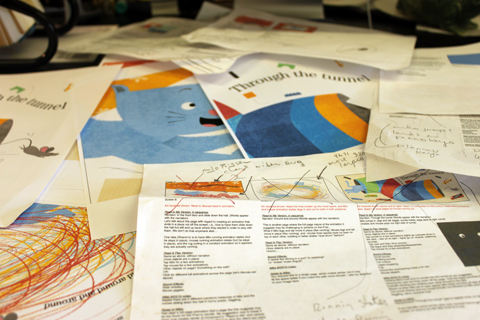 He suggested I tweak some things, which I did and then it was basically ready to show potential publishers. Rubin Pfeffer: Mike, I didn’t see that (version of the) Milo style — hmmm, pretty cool. 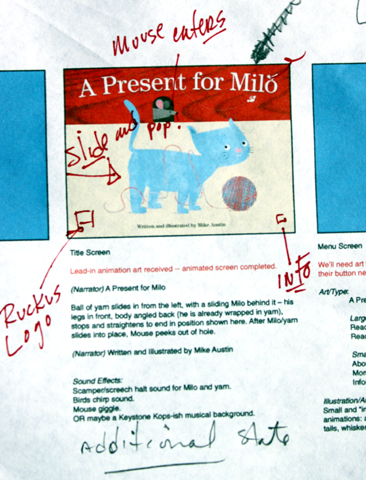 From book idea to iPad app. . . .
Our next Countdown Interview will feature the iPad app, “A Present for Milo,” produced by Ruckus Media. 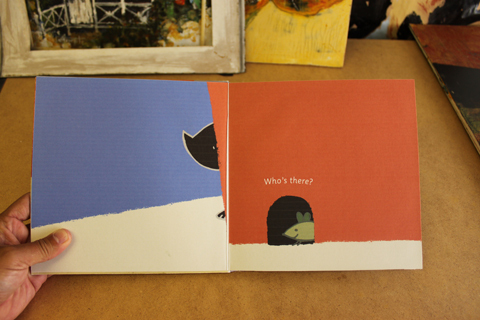 “A Present for Milo” started as a picture book idea. Then it was turned into an original iPad app, harnessing full use of its unique capabilities. 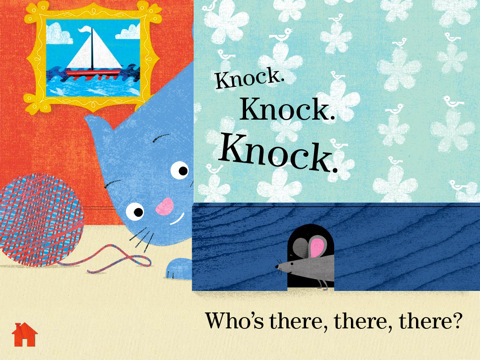 The inspired combination of Milo-the-cat’s perky characterization, plus many surprises for kids to tap and discover, and dazzling color textures culminated in a 3-book contract with Blue Apple books. We’ll chat with author/illustrator Mike Austin, meet his agent, Rubin Pfeffer, and go behind the scenes. Have questions? Attend the interview and post them here!